On Saturday, November 15, the Home of the Mother in Chone (Ecuador) had the grace of participating in a procession/pilgrimage to the nearby town of Canuto. 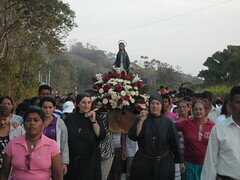 Each year, to celebrate the feast of Our Lady of El Quinche (November 21), patron saint of Canuto, people walk from Chone to Canuto (13 kilometers) in procession with a statue of Our Lady. Throughout the nine previous days, different people and groups from the surrounding villages pilgrimage there as well. When the Servant Sisters arrived for the procession, we were asked if we could carry our statue of Mary in procession to Canuto. Some, affectionately, began to call the statue "la flaca" (the skinny one). Excited to use the new platform that had been made specifically to carry Our Lady in the procession, we left the parish of St. Cayetano at 5:00 am. In a prayerful atmosphere, and with the joy of being able to accompany Our Lady, we processed praying the four parts of the Rosary, the Stations of the Cross... and singing. There were people of all ages. At the entrance of Canuto, the people were waiting for us with a typical Manabi breakfast food called 'bollo' and hot coffee. And, as Our Lady always leads us to her son, we got ready for the culmination of the morning with the celebration of the Holy Mass, which took place at 10:00 am. After Mass, the girls of the Home returned to the Sister’s House, where they had a mini-get-together. 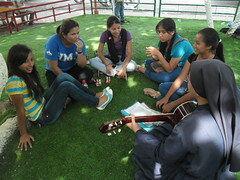 The sisters prepared a competition with challenges and questions, and we all had a great time. We concluded the morning, exhausted by so much physical activity, with a delicious meal, which gave us back our strength: a tasty dish of macaroni with minced meat, a cabbage salad and cream filled cookies. We give thanks to Our Mother for having allowed us to accompany her during this morning and also because she never leaves us during our journey through life.